There are seven paths to the Chartered Professional in Human Resources (CPHRTM) designation. To earn the CPHR designation, you must maintain an active membership with CPHR BC & Yukon for the full course of the CPHR path. Learn more about membership. Three years of professional-level HR experience within the past 10 years. 8 years of professional-level HR experience. Please note: An accredited degree in HR meets the requirements of both bullets 1 and 2 above. To apply for certification through Path 3, please send official transcripts demonstrating an average of 70%, the exam exemption form and fee payment to cphr@cphrbc.ca. CPHR Canada and the member associations, including CPHR BC & Yukon, are constantly reviewing and accrediting post-secondary programs in each region. For a full list of accredited post-secondary schools across Canada, please refer to cphr.ca. Three years of professional-level experience within the past 10 years. To apply for certification through Path 4, please send official transcripts demonstrating an average of 70% or C+ in the accredited degree and complete the exam exemption form and fee payment. Please note: no current agreements under this path as of July 2016. Updates will be posted as they are approved. 10 years of senior professional-level experience as a senior HR professional or an accredited professional working in an HR-related discipline. To apply for certification through Path 5, please contact the CPHR registrar. Inter-provincial transfer of a CPHR (or alternate designation) holder in good standing of another province deemed to be substantially equivalent or greater than CPHR BC & Yukon certification requirements. Recognition of a CPHR equivalent designation holder in good standing of another jurisdiction with whom CPHR BC & Yukon or CPHR Canada enjoys a Mutual Recognition Agreement or is deemed to be substantially equivalent (i.e. AHRI, CIPD, HKIHRM, SHRM, CHRL or CHRE) or greater than CPHR BC & Yukon certification requirements. 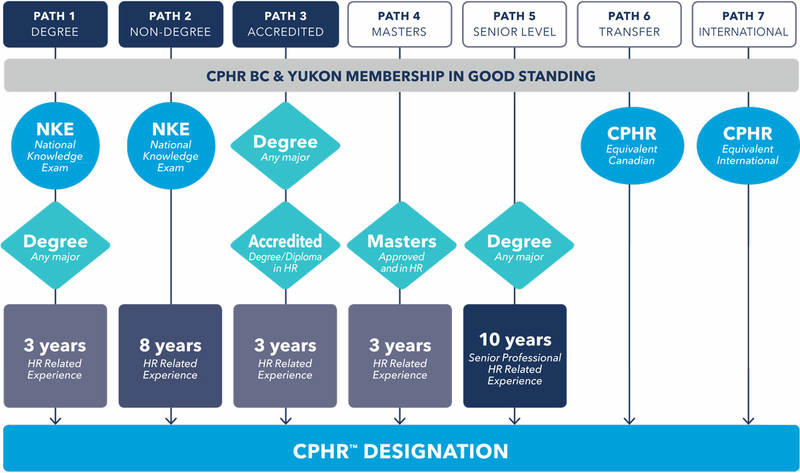 International prospects having satisfied a certification path approved by CPHR BC & Yukon and deemed to substantially meet or exceed the conditions of CPHR BC & Yukon certification requirements. To apply for certification through Path 7, please contact the CPHR registrar. Questions? Please contact the CPHR registrar.